It's time to announce another level editor from my hands: Vinyl Goddess from Mars level editor! Vinyl Goddess from Mars is another great game of my childhood, just like Hocus Pocus. I liked it especially for its awesome and jungle-themed graphics, catchy music, dynamic gameplay and of course the pretty heroine. 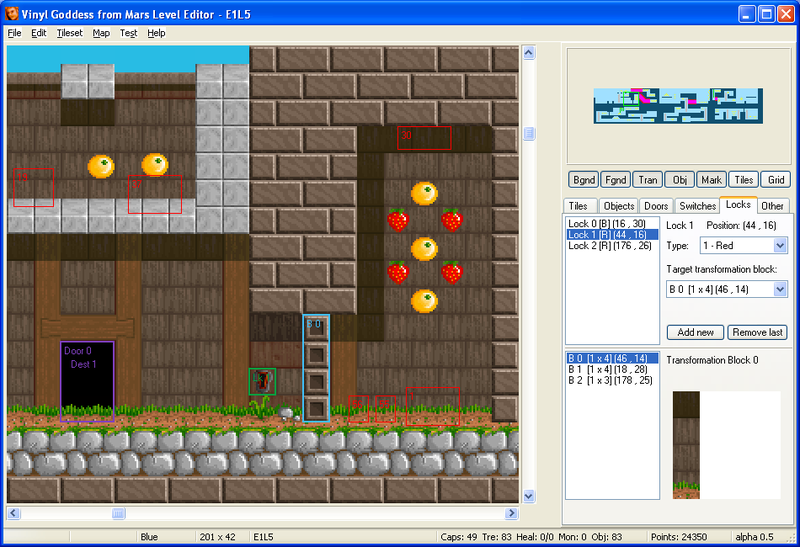 So it became the best candidate to make another level editor for. I like making level editors for such games, and in this case I needed to do (much, but not all) reverse engineering of the level format so it was even more fun for me. Additionally, I'm now coming up also with a mod I made with the editor: A level pack with two brand new custom levels for this game! I probably should have made this already also for Hocus Pocus, but I am personally not very good at mapping and designing levels and I just had no inspiration to make anything for Hocus Pocus. But I like VGMF so much and it has so gorgeous eyecandy graphics so I could not resist to make some good forest-themed level with use of all the tileset capabilities that were not used in any original level. 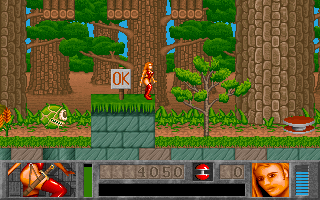 The second level is actually a remake of a level from other game, you will be definitely surprised. And in the end, this is definitely a good way to promote the editor's and modding possibilities for this game! This time the editor comes with a readme file with some basic tips and instructions how to do things. Last edited by Hisymak on Sun Jan 08, 2017 16:06, edited 3 times in total. That's some solid coding, love it, brilliant. Levellass wrote: That's some solid coding, love it, brilliant. Btw I see that this game is probably not so much popular and well-known among people there and overally, as I originally thought. Concluding from very poor feedback and interest in modding of this game. So do you, who read this post, know or have you ever played this game? Or even tried out my level pack? Well, here is the preview of the second level in my level pack which can be downloaded from the first post. It looks quite familiar, doesn't it? So let's give it a try! I have played this game, but I don't like it. nice effort, but I cannot take a fancy for this game. it just don't suits my taste. the only thing that strikes me is the soundtrack. but again, nice coding over there. OK, thank you guys for your replies. I must admit I haven't played or liked all the popular classic games as well, for example I have played Jazz Jackrabbit or Duke Nukem 2 very few in my life. But I'm really a big fan of VGFM and I still believe there's someone over here who likes it too but probably haven't noticed I made such stuff. It's an OK game, but I would have preferred it as a sequel to JotJ, instead of the desperate angle they took with it. Last edited by Hisymak on Fri May 20, 2016 19:11, edited 3 times in total. You didn't care yes, but that's the kind of early exposure to sexism and exploitation which normalises such things for little kids and holds back progress. Even back then I didn't see it as normal. It was just.. weird. The whole story seemed so... last minute, tacked on, excuse-plot. I was thinking 'Why didn't they go with something like J0tJ?' (Not knowing that that was actually what it had started out as.) Surely there was a better angle they could have taken, the one they went with seems odd and slightly desperate. The game is solid enough, but it's let down. Any game with the words "Vinyl" and "goddess" in the same sentence is bound to be booted off my list, regardless of the quality of graphics and programming. *sigh* It's a shame, really. They could have made a great game, but they chose the Hollywood path. I'v only tryed a few levels, with keyboard and a PS3 controller, and i feel like the game suits best a controller, due to the bit tricky movement the character do, but i do think this is a cool game, at least when i tryed it. But i think the keyboard controlls is a bit overcomplicated, my controller did a better job. I definitely played this game a lot, I have great memories of it! I also made an article about this on my website (welovedosgames.net). It's a solid sidescroller. Great work with the editor! Play my sidescroller on Platformania.com! Nice post on your website. (also updated the link in the first post). Just to inform you, I've made one more level some time ago and I am planning to do even one or two more, then I'm going to release a new version of the level pack. But I kind of lost the inspiration, but will hopefully get into it again. I have played Vinyl Goddess From Mars ages ago, but not very much of it if I recall. I think it was a shareware version on a compilation CD or something? I may have though it reminded me of Jill of the Jungle at the time, since it apparently was originally supposed to be a sequel to Jill that explains why. 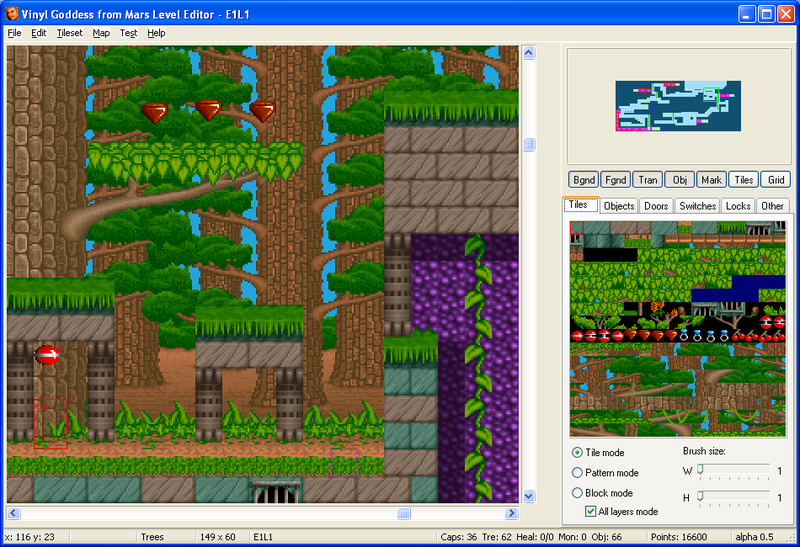 Interesting to see a level editor for it.